Many modern angling guides offer the chance to catch big fish with little fuss. Using modern techniques and baits and fishing venues with a proven pedigree. At River Days, things are a little different. Under the guidance of Steve Roberts (see People we Like) we can still expect a fish or two for our money, but as important is for the day to capture the true essence of angling. 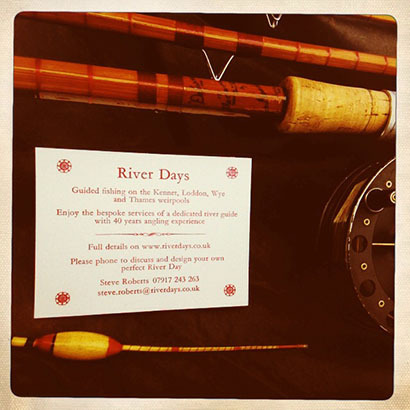 Whether casting flies for salmon, or trotting a stick float for dace, or chasing chub, Steve offers a range of vintage and modern hand built rods for use by his clients, with reels to suit – all created from master craftsman such as B James and Edward Barder. Lunch is a civilised affair – meats and cheeses, olives and pies – perhaps washed down with something cool and hoppy or soft and fruity. And don’t expect to be packing up as soon as the sun begins to dip. Darkness offers its own unique experience and opportunity and Steve is only too happy to explore it with you. It all sounds rather nice, doesn’t it? For more information visit www.riverdays.co.uk.